NEW YORK (AP) - The days of the absurdly low mortgage rate are over. The average rate for a 30-year home loan rose above 5 percent this week for the first time since last April - just as Americans are feeling more secure in their jobs and confident about the economy, and just before the big spring home-buying rush. Freddie Mac said Thursday that the average rate was 5.05 percent, almost a full percentage point higher than in November, when it hit a 40-year low. Economic signals suggest the recovery is gaining momentum. New claims for jobless benefits came in this week at the lowest in three years, and the unemployment rate has fallen nearly a full percentage point in two months. Americans are spending more and saving less. The exception is the beleaguered housing market. Record foreclosures have forced home prices down, and last year was the worst for sales in more than a decade. About the only good news was that qualified buyers could get the deal of a lifetime from their lenders, if they had the means - and the stomach - for the market. Now rates are rising, and analysts expect that will continue through the end of the year, to about 5.5 percent. The next few months are the busiest for the housing market - about one in three home sales happens in the spring. "It doesn't help," says Greg McBride, a senior financial analyst with Bankrate.com. "Any increase in mortgage rates takes away buying power and dilutes the incentive to refinance." Rates have been rising since the fall, mostly because of fears that higher inflation is coming. Investors have been demanding higher yields on Treasury bonds ever since the Federal Reserve announced its program to pump up the economy by spending $600 billion to buy government debt. Mortgage rates tend to track the yield on the 10-year Treasury note. Mortgage rates are still extremely low by historical standards. Anyone who bought a house 30 years ago might remember paying 18 percent on their loan. And many analysts say low lending rates are less likely to persuade people to buy than, say, reasonable home prices or a steady job market. "You'll see some effect on demand, but it's really how secure people are in their jobs and how much money they feel they have relative to their homes," says Cristian deRitis, an economist specializing in housing for Moody's Analytics. "Many of those people just won't buy a house," says Wells Fargo senior economist Mark Vitner. "They'll hold off." 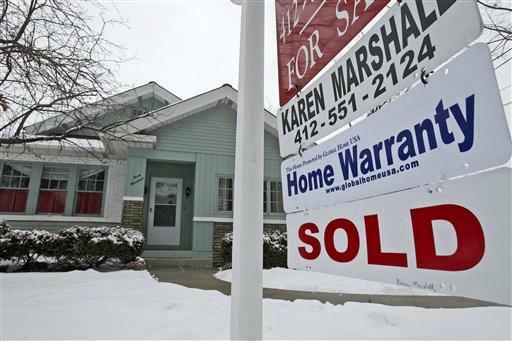 Home prices are expected to fall at least 5 percent more this year. Because of the feeling that the home isn't the failsafe investment it used to be, renting is more attractive. Especially when some analysts say it could be years before prices return to their pre-recession peak. That may be contributing to the fact that, despite record inventory levels of affordable homes in nearly half of U.S. cities, mortgage applications continue their downward slide as buyers remain on the sidelines. "Believe it or not, what I'm seeing, and I'm working with first-time homebuyers, they are not as affected by the interest rate as they are by getting a down payment," says Julie Longtin, a real estate agent with RE/MAX Cityside in Providence, R.I. "That's what is holding them back." On a $200,000 loan, the payment difference between today's rate and November's is less than $100 a month - hardly enough by itself to spook a buyer. If rates continue to rise, as many predict they will, the housing market will be in for yet more trouble. "Six percent would do serious damage if it happened in a very short period of time," said Patrick Newport, U.S. economist at IHS Global Insight. Even 6 percent would be a bargain for homebuyers historically. Rates were in double digits through most of the 1980s. It wasn't until 1991 that rates consistently stayed below 10 percent. At the peak of the credit bubble in July 2006, the 30-year fixed mortgage was 6.76 percent. All this leaves buyers wondering: What is the new normal for interest rates? "We're turning to a more normal mortgage rate environment, says Guy Cecala, publisher of the trade magazine Inside Mortgage Finance. "That pretty much means the 30-year in the 6 percent range. I don't think rates will be going down." AP Business Writer Derek Kravitz in Washington contributed to this report.